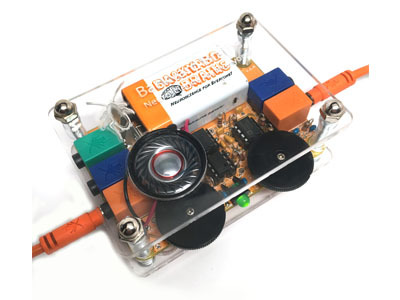 The human body has over 600 muscles and now with our 2-Channel Muscle SpikerBox you can record (in real time) the bio-electrical activity from not one, but TWO of those 600+ muscles, at the same time! Yes, you've read right, that's two simulataneous EMGs (Electromyograms) from just one device! 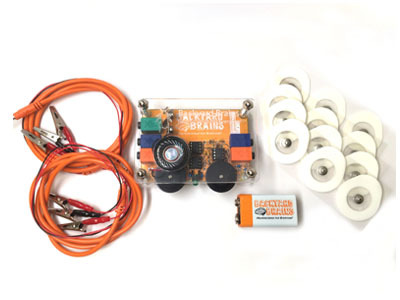 This 2-Channel version allows you to perform all of the inquiry-based experiments from the classic Muscle SpikerBox, such as identifying individual motor units and recording individual muscle spikes via easy on/off "sticker" skin surface electrodes. The original Muscle SpikerBox provides an endless amount of possibilities and now with this new version, you have double the endless amount! Your 2-Channel Muscle SpikerBox will allow you to observe the electrical activity of two opposing muscles, such as your Biceps and Triceps, and learn how these "antagonistic pairs" alternate contracting and relaxing to allow you to flex and extend parts of your body. Or you could place the electrodes on two identical muscles on two different humans and compare their electrical impulses! Arm wrestling anyone? With our mobile app, "Backyard Brains" (available for free in Google Play and Apple App Store) and/or our brand new computer software, "the Spike Recorder", recording and analyzing your electromyograms has never been easier! The 2-Channel Muscle SpikerBox is the double upgrade of our first invention to be used on you, the human. Just like the original Muscle SpikerBox, it has an individual gain knob for each channel, allowing you to control the amplification of your recording depending on the size and type of muscle from which you are recording. Each of the two EMG channels has their own ground electrode and 2 recording electrodes for true differential recordings of your muscles. It also has two audio jacks located on the front so you can hook up both an external speaker and your mobile device or computer at the same time. Note: for 2-channel recordings on a single device, you need a laptop with either a stereo (2-channel) line input or a USB sound card to do this, as your mobile devices typically only allow one channel. Our 2-Channel Muscle SpikerBox comes with 12 sticker patch electrodes that are can be used for large muscle recordings, such as your forearm flexors, biceps, gastrocnemius, or hamstrings. As with all of our SpikerBoxes, it interfaces with your smartphone, iPad and computer. Order yours today and get started exploring muscle physiology, two muscles at once! Notice: The device speaker can only sound EMG #1 (the one on the right side). To hear both EMG #1 & EMG #2 simply plug in a headphone set or a stereo speaker. Video of 2 Channel Muscle SpikerBox in Action! Features a gain knob for each EMG channel, so you can individually tune the amplification of recordings.